Are your kicking techniques as good as you would like them to be? If not, Essential Basics, Volume Three is for you. 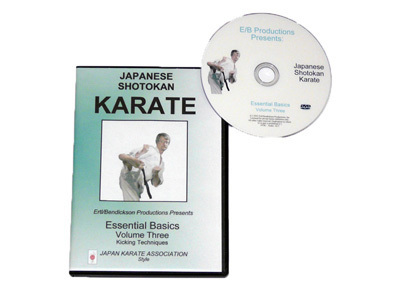 With this DVD you will learn the dynamics necessary to deliver fast, powerful kicks and sweeps that are effective and practical. Essential Basics, Volume Three shows you how to use natural movement to develop good balance and control over your body to create momentum and then convert this momentum into force by using snapping and thrusting actions. 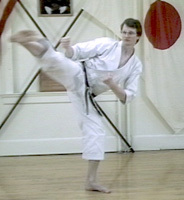 Front snap, side snap, roundhouse, side thrust, front thrust and back thrust kicks are broken down in detail using principles which are easily applied to all kicking techniques. Practice drills for self-training are presented to help you develop a better understanding of these actions. 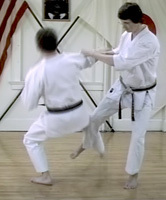 Sweeps are used in traditional karate to create openings by upsetting your opponent’s balance. 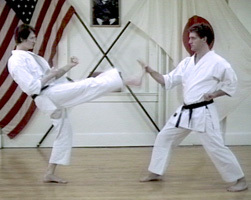 This DVD shows you how to deliver sweeps with the control necessary to be effective when using these very practical techniques. Finally, we include useful combinations of kicks and sweeps for use in practical situations.